A couple weeks ago, I shared a bit about how Dave and I might literally have more “usable hours” in our days, due to the fact that we seem to require fewer hours of sleep than other adults. I also shared about how using the timer on my phone gives me increased motivation to work quickly and stay focused on the task at hand. Both of these are huge productivity boosters when it comes to accomplishing everything I need to, and want to, cross off my list. 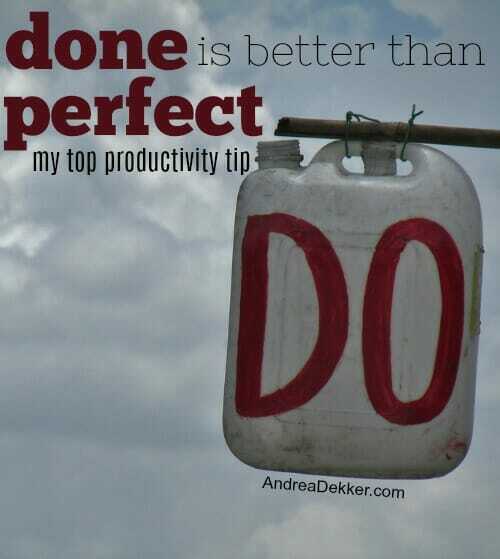 However, a third piece to my “productivity puzzle” is the fact that I am almost always focused on “done” versus “perfect”. 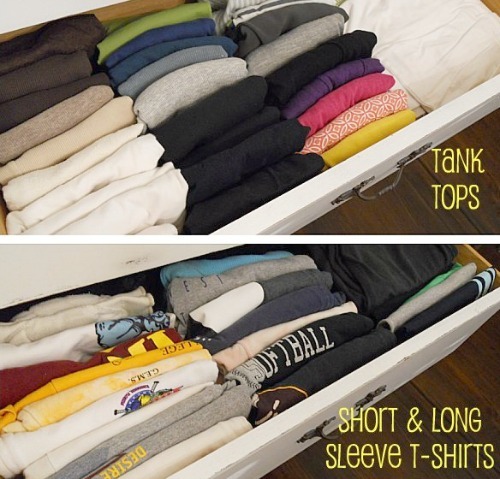 Although I can be particular about certain things (like how I fold my t-shirts), I am far, far from a perfectionist. I value quantity over quality (in a good way! ), I work quickly and keep moving, I continually “do the next thing”, and I rarely get hung up on little details. My goal is to FINISH one thing… then MOVE ON to the next. My Blurb digital photo books are often slightly out of order and/or missing a few pictures because I didn’t want to redo the layout to add them in. It’s fine… the pictures and pages I DO have are much better than doing nothing at all, and I fly through my books in record speed when I’m adding pictures each month! I don’t deep-clean my home on a weekly (or even monthly) basis. Instead, I enjoy the fact that my home is very neat, tidy, and organized almost all time… and I look the other way when I see the dust building up on the baseboards again. I’m a happy camper as long as my bathrooms are fairly clean, my floors are fairly crumb-free, and my flat surfaces are fairly decluttered! Although I enjoy cooking and baking, I’ve never been an exclusively “from scratch” chef. I’m a huge fan of starting with a boxed mix, or incorporating some packaged components into my meals in an effort to save lots of time. I also regularly use the convection feature on my oven to speed up the cooking and baking times. I don’t sort my laundry — true story! I just wash whatever needs to be washed, whenever I do laundry (I’m still using the twice-weekly system I shared a couple years ago). I almost always apply the second coat of paint too soon — it hasn’t come back to bite me yet! And I’ve been known to paint doors ON their hinges so I can paint both sides at the same time without waiting for drying time in between. Maybe these examples make me sound like a lazy slob… I hope it’s obvious I’m not!! I can be extremely detail-oriented when the situations requires it… but for the most part, I try not to get too hung up on little details and just keep pushing forward. I know everyone works and functions differently, and I know true perfectionists often can’t fully control their OCD-like behavior, but I also know there are many instances when all it takes to stay on track is simply focusing on finishing a project instead of perfecting it. If you feel like you’re constantly “in the middle” of a project, or like you never have time to fully complete the things on your to-do list, take a step back and honestly evaluate how much pressure you’re putting on yourself. If you’re too worried about getting everything in your home perfectly labeled and in matching bins, chances are you’ll never actually start the organizing project in the first place. If you’re too worried about making every single morsel of food in your home completely from scratch, chances are you’ll feel overwhelmed, throw in the towel, and resort to frozen pizza or fast food much quicker than you would if you simply did your best to get a fairly well-balanced meal on the table and then moved onto the next thing on your list. If you’re too worried about keeping every space in your home perfectly clean, you won’t have time to actually enjoy your home and you’ll most likely end up neglecting many of the other things on your list. What area of your home, life, schedule, family, job, etc. could benefit from focusing more on DONE versus PERFECT? Such a good reminder. I need to be content with the relative state of “done” that our house is in now…I tend to always be striving for that next step, which can be good I guess, but also can give me a sense of discontentment. After living in a tiny house that became quite cluttered over the course of having four kids and saving things for “someday”, now that someday has arrived and our home has been enlarged, I’ve finally gotten things decluttered to a very comfortable level. There’s always more to do though, which gives me that nagging feeling of never being done. I’m going to find time this week to go back through your posts on photo books. This has been a longtime goal of mine, but I’ve never taken the time to do it because it seems like such a huge, daunting task. I think if I can do one year of a “done rather than perfect” photo book, it’ll give me the momentum to start chipping away at past years. This really does deserve some of my time, because pictures and memory keeping are a huge priority for me. I just want to make sure you saw the post I did a month or so ago — a recap of EVERY post I’ve written about my digital photo books. You can take a look here!! that’s a great way of looking at things — thanks for sharing Meghan! I just fed my children a “done vs. perfect” lunch: one small pb& j split amongst three children, leftover sliced olives, leftover cooked broccoli, dried fruit. I’ll make sure they get more protein later. In the meantime, it didn’t take much cooking, it’s using up what’s in the fridge, and they’re back outside busily playing. After moving to a new house in a hurry before the baby came, I have many corners that need some “done vs. perfect.” Closets, drawers, shelves. On the positive side, I knew I needed to just get moved in and get the boxes unpacked, even though those spaces were not perfectly, beautifully organized. Happily, I work as a proofreader. That’s where I unleash all my pent-up perfectionism. Finding all those little errors is the perfect outlet. Then I periodically resurface to the messy, real world filled with my children and their stuff and their needs, where every “done” is a victory. haha — I love this “happily, I work as a proofreader.” I’m so glad you can unleash your perfectionism in that way!! I couldn’t agree more, i struggle with finding the perfect balance in finishing a task all the time. Totally agree with your perspective – “done is better than perfect” especially when it comes to cooking. Cooking everything from scratch is extremely time consuming and as you mentioned can be overwhelming especially if you have time constraints. So cooking partially from scratch is the way to go. Thanks for sharing this great post. I think it’s all about priorities though — some people place a VERY high priority on cooking all their foods from scratch and knowing what’s in all their foods. They might spend considerably less time cleaning their house, gardening, or doing volunteer work. “The perfect is the enemy of the good.” Timeless and true, but not always easy to follow. Thanks for the encouragement. Good quote — thanks for sharing! Yes – I love this. I am too a done over perfect girl. And when I find that I’m not getting something done, or procrastinating – it’s because I’m trying to do or thinking I need to do it perfect. This done over perfect mentality does make it interesting when you’re married to someone who is the opposite!! I’m sure that would be interesting! Dave is a “just get it done” type of person too, so we don’t have that “conflict” between us — but I can definitely see how it would be tricky to balance 2 different personalities! I don’t think anyone who has read this blog more than four times would think you are a lazy slob! haha — I hope not! But you never know! I can assure you, I’m not a lazy slob!! “My Blurb digital photo books are often slightly out of order and/or missing a few pictures because I didn’t want to redo the layout to add them in.” – what a freeing sentence to read! My brain just doesn’t work that way. I was also raised with, “If you aren’t going to do it right, do bother doing it at all” and at least when it comes to photo books I figure “right” is in order. But done is better in this case! oh good — glad to “free” you to have slightly non-chronological photo books! Oh Andrea if only I had found you about 30 years ago. I am a perfectionist with overthinking super powers (ha ha!) and that has caused me much grief in my life. At 51, I am much better than I used to be, but this kind of info is exactly what I have had to focus on in order to enjoy life more. I am good at planning and organizing and taking care of all the little details, but I’ve really had to work on letting some things go. In my opinion, you have such a good handle on true balance in life. Thanks again for sharing your gifts! But I’m glad you found me now!!! I get frustrated doing the simple, every day things when I don’t have time to make the room “perfect”. Why put away the laundry and make the bed if I don’t have time to dust the bedroom, wash the curtains and vacuum every book and cranny? Because it’s still better than nothing!! An unloaded dishwasher is better than a pile of dishes in the sink that are waiting for the dishwasher space! Even if I can’t, at that moment, also wipe all the cupboards, clean out the fridge, etc. Yes… just keep reminding yourself that something is better than nothing!